BRUSSELS, Oct 24 (Reuters) – European Union leaders struck a deal on a new target to cut carbon emissions out to 2030, calling it a new global standard but leaving critics warning that compromises had undermined the fight against climate change. Talks in Brussels stretched into the small hours of Friday as Poland battled to spare its coal industry and other states tweaked the guideline text on global warming to protect varied economic interests, from nuclear plants and cross-border power lines to farmers whose livestock belch out polluting methane. In the end, an overall target was agreed for the 28-nation bloc to cut its emissions of carbon in 2030 by at least 40 percent from levels in the benchmark year of 1990. An existing goal of a 20-percent cut by 2020 has already been nearly met. EU leaders called the 40-percent target an ambitious signal to the likes of the United States and China to follow suit at a U.N. climate summit France is hosting in December next year. “Ultimately, this is about survival,” said summit chair Herman Van Rompuy, the president of the European Council. But environmentalists had already complained that the deal could still leave the EU struggling to make the at least 80-percent cut by 2050 that its own experts say is needed to limit the rise in global average temperatures to two degrees Celsius. The European Union accounts for about a tenth of world greenhouse gas emissions and has generally done more than other major industrial powers to curb the gases blamed for global warming. But Green campaigners said Friday’s deal signaled the EU was becoming less ambitious. Aside from the headline emissions goals, they were disappointed by a softening in the final agreement of targets for increasing the use of solar, wind and other renewable energy sources and for improving efficiency through measures such as insulation and cleaner engines. Diplomats said bargaining by Poland’s new prime minister Eva Kopacz, who faces an election next year, secured a complex set of financial incentives. They include free allowances in the EU system for trading carbon emissions to soften the impact of the target on Polish coal miners and the coal-fired power stations on which its 38 million people depend. Concerns in Britain and some smaller states about additional EU regulation that might, for example, crimp a new expansion of emissions-free but controversial nuclear power, saw targets for increased use of renewable energy and for energy efficiency softened. Van Rompuy said the two targets would be for at least 27 percent. They would also only apply across the bloc as a whole, unlike the broad 40-percent target that binds each state individually. 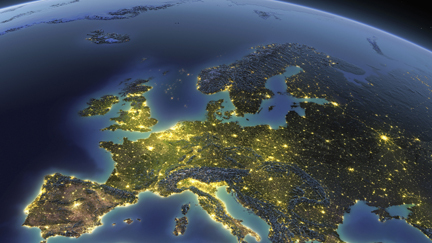 Renewable energy sources produce about 14 percent of the EU’s energy at present. Some industrialists have complained that EU climate regulations risk discouraging business and investment in the bloc at a time when its faltering economy can ill afford to lose it. But others, echoed by EU officials on Friday, see changes in energy use as an opportunity to develop new industries. Portugal and Spain succeeded in getting a harder target for the level of cross-border connections, something they had been pushing France to accept so that they could export more of their spare energy across France and to the rest of the continent. Our Planet’s Primal Scream — Is Anyone Listening? Recent headlines have sounded the alarm on the mounting impacts of climate change. Over the past few months, we have seen everything from the hottest summer on record, to historic droughts and extreme wildfires ravaging communities in California, to vanishing wildlife habitat in Alaska, to toxic algae blooming out of control and contaminating drinking water supplies in America’s heartland. In California, the first six months of 2014 were the hottest on record, and 82 percent of the state is currently experiencing extreme drought. And the situation is expected to get worse — recently scientists predicted that 2014 will end as the hottest year ever recorded. Experts also tell us that climate change has tripled the probability that the drought-causing weather conditions will continue. This historic drought is contributing to more frequent and intense wildfires. In the past, California’s wildfire season lasted about three months out of the year, but now it is virtually year-round, and that is straining our state’s budget. Disturbing pictures in Alaska showed 35,000 walruses — almost all females and calves — stranded on a beach. They should have been able to use the Arctic sea ice to dive for food, but the ice is gone. Temperatures in Alaska’s North Pacific Ocean are the warmest ever recorded, and the amount of Arctic sea ice shrank to one of its lowest levels on record. According to new peer-reviewed findings, the warming waters and melting ice have also led to sea levels rising at rates unprecedented over the last 6,000 years. In August, toxins were found in Toledo’s drinking water supply after an algae bloom formed over an intake pipe in Lake Erie. An emergency water ban was imposed to protect 500,000 Ohioans from the dangerous toxins, which can cause vomiting, diarrhea, and harm to the liver. Scientists have warned us for years that poisonous algae blooms are exacerbated by climate change. However, instead of confronting this crisis, congressional Republicans are trying to gut our clean air protections that help tackle dangerous climate change. Over the past four years, the Republican House has voted well over a 100 times to repeal the health-based standards that are the heart of the Clean Air Act, including trying to roll back the president’s authority to limit carbon pollution. President Obama has taken important steps to address climate change, such as proposing standards to control dangerous carbon pollution from power plants. Cutting carbon pollution will also reduce many types of other air pollutants that threaten human health with respiratory illnesses like asthma. We all benefit from having clean air to breathe — it literally saves lives. What we need is a price on carbon pollution to reflect its true costs on society. Last year, Senator Bernie Sanders and I introduced the Climate Protection Act. Our bill would establish a fee on each ton of carbon pollution emitted from the petroleum, coal, and natural gas that we produce and import. Under our bill, 60 percent of the revenue would be returned directly to taxpayers, and the remaining portion would be reinvested in promoting renewable energy, enhancing job growth in a clean energy economy, and increasing the resilience in the nation’s infrastructure.